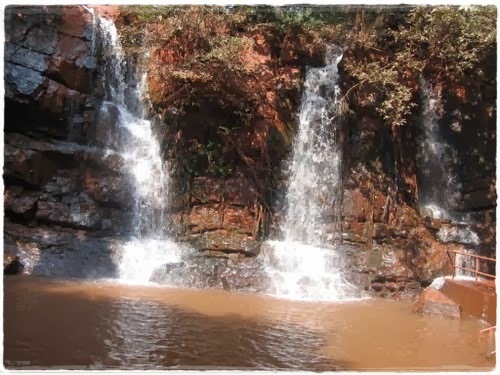 Murga Mahadev waterfall located at Barbil Tahsil in Keonjhar district of Odisha. This place is famous for Murga Mahadev temple ( a Siva temple). This place is pulled up with natural beauty that giving an good experience to every tourist. The Murga Mahadev waterfall is flows from the Thakurani hill. The waterfall side the small forest increasing the beauty of this place. Also this place is one of the popular picnic spot of this district. The small waterfall dropping in two drops flowing. Also the waterfall creating an small river that is giving an amazing beauty to this place. Also near side of the waterfall many types of plants are their those are created by local peoples those are increasing the attraction point of this place. This place is best for natural lovers. The Murga Mahadev is the deity of this place. Mostly the Murga Mahadev temple is dedicated to Lord Shiva. The Murga Mahadev word originated from two words that is Murugan and Mahadev. The means of the words is Murugan is Kartikeya and Mahadev is another name of Shiva. Also thousands of devotees every month visit this place to get blessings from Lord Shiva and also as well as get experience from the waterfall. The waterfall near side trees are giving an another beauty to this place. Also this place is combination of natural beauty and as well as the religious shrine. Road ways : This place is just 227 km from Bhubaneswar and all types of road travel facilities are connected to this place. Rail ways : Nearest major railway station is Keonjhar. Air ways : Nearest airport is Bhubaneswar.